As UCLA undergraduates, brothers Jorge and Andrew Sincuir donated blood and platelets often. In fact, after Andrew learned that a patient responded well to his platelets, he began donating every two weeks, racking up 67 donations over four years. Sadly, Andrew and Jorge's dad learned that lesson the hard way. In a twist of fate, Jorge, Andrew's big brother, suffered a horrific car accident last April and nearly bled to death. Two weeks later, his father drove to UCLA from his Lancaster home to donate blood for the first time. 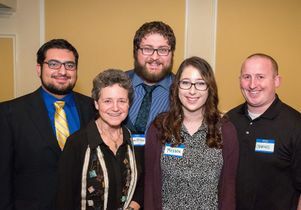 At an emotional event organized by the UCLA Blood and Platelet Center on Tuesday, the Sincuir family met three of the 27 people who had donated 50 units of blood products to save Jorge’s life. Jorge was driving in a heavy rainstorm when his car hydroplaned across Sunset Boulevard into oncoming traffic. An SUV crashed into the driver side of his vehicle, leaving him bleeding heavily from a shattered pelvis, left hip and left arm. Paramedics extracted Jorge from his totaled car and sped him to the emergency room at Ronald Reagan UCLA Medical Center. Initially appearing stable, Jorge’s blood pressure suddenly dropped dangerously and his condition turned dire. 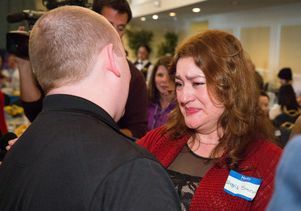 Reed Hutchinson/UCLA - With tears in her eyes, Ingrid Sincuir, Jorge's mother, thanks UCLA hospital security officer Charles Bolan for his donation of blood to save Jorge's life. At 6-foot-4 and 280 pounds, Jorge’s large build required three grueling surgeries to reconstruct his bones. After his kidneys failed, doctors aborted his first surgery and induced a coma to stabilize him. When Jorge awoke three days later, his vision disappeared for a terrifying week. During the course of his six-week stay, UCLA hospital staff transfused him with five gallons of blood, equivalent to five times his body’s entire blood volume. Bedridden at home, Jorge relied on the support of his family and his girlfriend, Alexandria, and the welcome distraction of Netflix for his recovery. His mother, Ingrid Sincuir, who emigrated from Guatemala with her husband when Jorge was 2, appointed herself his physical therapist and oversaw his rehabilitation. With her help, he slowly regained his strength and learned to move using a wheelchair, walker and cane. “I had all sorts of good things to say until I met Jorge’s mom,” Blitzer said later. “She looked into my eyes and was so grateful that she started to cry. I started to cry along with her and forgot everything I wanted to say. Jorge closed another circle when he returned to his hospital internship on Jan. 4. In yet another coincidence, he’s studying to become a clinical lab technician — the person who processes blood donations for patients.